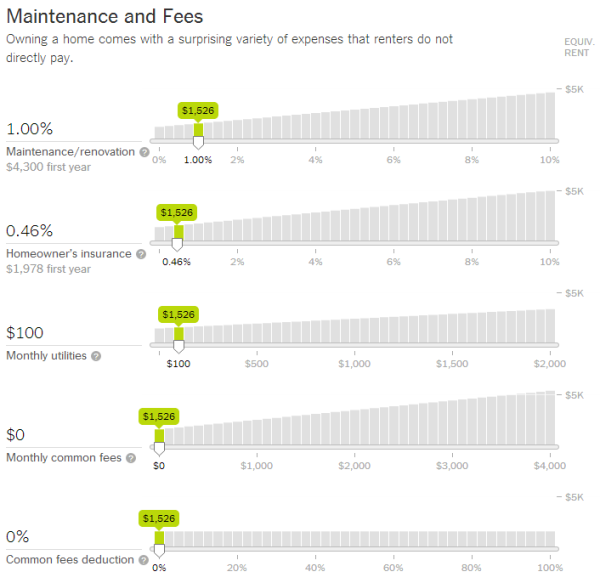 For years, the gold standard in online buy vs. rent calculators has been the one created and hosted by the New York Times. 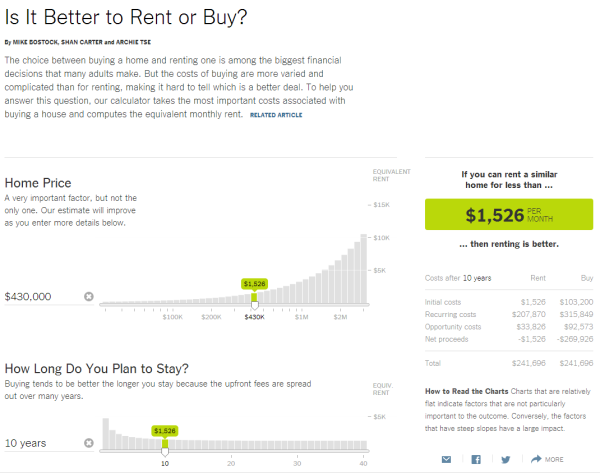 This week, they released a brand new, updated and enhanced version: Is It Better to Rent or Buy? The new version lays out all of the variables in a clean and simple vertical layout. As with their old calculator (which you can still use if you prefer it), they offer sliders for a wide variety of costs associated with both renting and buying. The thing I really like about this is that it highlights many of the home buying and ongoing ownership costs that cliché “you’re just wasting money if you rent” marketing from home salesmen conveniently overlooks. When I put in the numbers for my 2011 home purchase, the calculator suggested that even if home values don’t appreciate at all and I only stay in my home for 10 years (I plan to own it for good) I’d need to pay no more than $1,128 a month in rent to make renting the better financial choice. The 2-bedroom home next door to mine—less than half the size of my house—is currently renting for over $1,300. Plugging in a similar scenario for today’s median King County single family home price of $430,000 and a 4.25% rate on a 30-year mortgage gets you a monthly rent break-even point of $2,193. I haven’t tried renting anything in King County lately, but a Craigslist search seems to show quite a few homes for rent for less than $2,200. From what I can tell, the question of whether buying or renting is the better financial choice in the Seattle area is certainly a lot less clear today than it was a few years ago. The average wage is now $10.93/hr and 28 hours/week. It makes figure like $1000-1500/mo a total joke….its the entire net pay basically. Get two incomes then? Where, in the Mother Goose Cooked Book jobs availability in a stagnant total labor force? Let alone get one job? 1. Take your Millenials into your home. 2. Help them financially if you’re able, college degreed or not [if you do this, get ’em in a cheap rent area, not Seattle]. They always say how much more a degree gets you in a lifetime….whose lifetime? The old lucky devil Baby Boomers’ and even the X Gens’….or the real lifetimes of the Millenials? The rest of us will mostly be dead by then. Thanks for posting Tim. My thoughts, the old NY Times calculator was better. It had far more variables the user could enter, tweak or modify, such as interest rates and renters utility costs. It also had timeline graphs for what if, scenarios the user could enter. Still consider it the gold standard for engineers number crunchers and the technical community. Of course, it’s also not *all* about what’s cheaper. If stability or having the freedom to remodel the space as you want is important, it may be worth paying a premium for those things. But “may be worth paying a premium” is indeed quite different than “renting is just throwing your money away”. Myself, it looks like owning a 2 bedroom condo on Bainbridge wins over renting an apartment here. Not by a whole lot, but it does win, assuming I’ll stay for 9+ years — which I plan to. Plus I get the freedom to customize the interior.